Two years ago, I made a special trip to visit a mammoth excavation outside Yakima, WA. The mammoth was discovered by a construction crew putting the finishing touches on a road to the home of Doug, and Bronwyn Mayo. The Mayos have been civic-minded enough to allow Central Washington University to keep the site as a teaching site. Every summer, CWU professors bring a group of paleontology students over to work on the site for eight weeks and give tours to interested tourists (like me). Besides just letting the University take over their driveway for two months out of the year, the Mayos take an active part in educating the public and have their own website. If you know any budding nature artists, this is their chance to get involved. 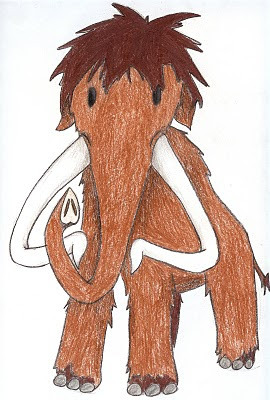 The Mayos are sponsoring a draw the mammoth contest for K-12 students. The deadline is July 30, 2010 and the winner gets $25 and a Wenas Mammoth t-shirt, which is way cooler than any dinosaur shirt. The details are here. I'll be putting up a reminder closer to the deadline.